Hi, I'm The Chickpea Chickadee, and I'm so excited to be guest posting on Wendy's fantastic food blog. It has been a pleasure following her blog and getting to know her. 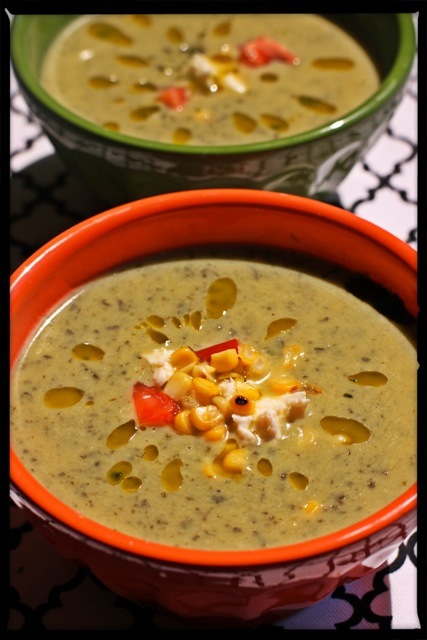 The recipe I'm sharing today is Roasted Poblano Soup. The first time I had this soup was at a neighborhood soup and salad place. I was hooked immediately. It is creamy, with a hint of heat from the peppers. The grilled corn and cherry tomato garnish gives it some texture and makes the flavors pop. We tend to like our food HOT down here in Texas, so you may want to check the level of heat in the peppers before you add them to the soup. Usually, I will make a generous portion of this soup and then have it for lunches during the week. It pairs nicely with some quesadillas or a nice green salad. Preheat oven to 350 degrees. Wash poblano peppers and rub them with olive oil. Place them on a baking sheet and bake for 30 minutes. Remove from oven and immediately place them in a brown paper bag. Let them sit for 10-15 minutes. Once peppers have cooled, remove skins and set aside. In a large soup pot, add onions and garlic. Cook for 5 minutes. Add in spinach and cook until wilted. Add cooked potatoes, roasted poblano peppers, cilantro, half-and-half and puree in a food processor or with a hand held mixer. Season with salt and pepper. Garnish soup with fresh grilled corn kernels, cherry tomatoes and cheese.